^ "History of SSL at IBM.com". Publib.boulder.ibm.com. Retrieved 2012-10-29. 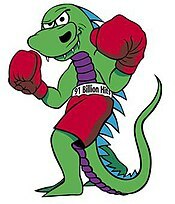 ^ "Mozilla Stomps Ahead Under AOL". Wired.com. Archived from the original on June 3, 2014. Retrieved 2012-10-29. 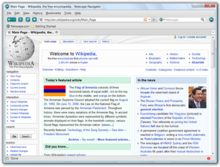 ^ "Netscape Launches Groundbreaking Netscape 6 Browser". netscape.com. 2001-12-13. Archived from the original on 2001-12-13. Retrieved 2012-10-29. ^ "FORM 10-K". Sec.gov. Retrieved 2012-10-29. ^ Hawn, Mathew (May 1995). 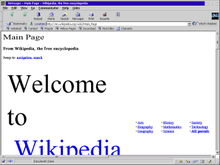 "Netscape Navigator. (Netscape Communications World Wide Web browser) (Software Review)(Evaluation)". Macworld. Retrieved May 17, 2011. (Subscription required (help)). Netscape Communications wants you to forget all the highway metaphors you've ever heard about the Internet. Instead, think about an encyclopedia—one with unlimited, graphically rich pages, connections to E-mail and files, and access to Internet newsgroups and online shopping. ^ "Whatever happened to Netscape?". Engadget. Retrieved 2017-03-22. ^ "Internet Archive Wayback Machine". Web.archive.org. 2008-04-06. Archived from the original on 2008-04-06. Retrieved 2012-10-29. ^ a b "Propeller.com Spinning to a Stop - Search Engine Watch (#SEW)". Search Engine Watch. Retrieved 2012-10-29.